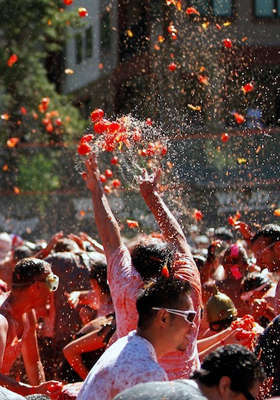 This entry was posted in My Musings and tagged fun, fun retirement, gusto, living with gusto, portland tomato battle, summer activities, tomato fight by justabackpackandarollie. Bookmark the permalink. Man, just hand over the shaker of salt and I’ll catch them mid air for a feast (unless they are truly destined for the dumpster!). Can’t wait to hear your report on The Battle! I’ll let you know how it goes. It sounds like a hoot+ to me. If want to travel in style to the real La Tomatine with an international bunch of fun people, check out the Tomatina Tour on thisisvalencia.com. We take you to the heart of the fight in a luxury coach, and afterwards it’s on to a country restaurant for showers, a swim and Paella (with lots of booze) followed by some more swimming an sun befor we return you to Valencia with a free tee shirt to commemorate the day. They are also experts on the city and can offer all sorts of help and advice on anything from accommodation to drinking, dining and sightseeing during your stay in the beautiful city of Valencia. Thank you! It is absolutely on my list of great things to do. Unfortunately, it won’t be this year. I will pass along your tour information as well to anyone who is looking to attend this wonderful and chaotic expression of fun.